Former judge Roy Moore, a candidate for Alabama’s U.S. Senate seat, defeated the incumbent Republican Senator, Luther Strange, in a primary last month taking nearly 55 percent of the vote. Moore, who was suspended twice from his job as the Chief Justice of the Alabama Supreme Court, is currently polling ahead of his Democratic opponent, Doug Jones (a former U.S. attorney in the state), leading up to the December 12th general election to replace former Senator Jeff Sessions. Moore’s victory has further divided Republicans, with those to the farther right (like Steve Bannon) backing his run, and those to the less farther right (like Mitch McConnell) feeling lukewarm, at best, about his victory. Most establishment Republicans generally do not care for him, while fervent right wingers appear to love him. Fortune recently wrote “Ray Moore Makes Ted Cruz Look Like a Democrat.” Imagine that? Moore is as off his rocker as Donald Trump, but Trump backed Strange in the primary. (Maybe Trump didn’t want too many cuckoos in the nest?) Trump wasted no time getting behind Moore, however, as he tweeted “Congratulations to Roy Moore on his Republican Primary win in Alabama. Luther Strange started way back & ran a good race. Roy, WIN in Dec!” soon after Moore’s victory. Why is this such a problem? One reason is that Moore is part of a group of conservatives that will probably refuse to compromise. If enough of these candidates win, no agenda will make it through Congress, halting the ability to do anything. What’s even worse is the consistency of Moore’s backwards thinking and the lengths he is willing to go in his attempts to further his campaign against decency and law. He may soon be in the Senate pushing his disgusting agenda. The problem is not that one rogue judge with a thirst for making the U.S. a moral Christian theocracy might win a U.S. Senate seat. Alabama is not the only place we will find candidates with extreme views that they’d love to force upon the nation. The Washington Post reported that “Bannon and other insurgent activists were previously looking to target Republican Senate incumbents in Arizona, Nevada and Mississippi.” Wherever they feel they can remove a moderate Republican and replace that candidate with one from the far right, they will make their move. And much as we’ve suffered these few months with Donald Trump, we will continue to suffer, maybe more, maybe differently, if the far right goblins get their way. Is this what we can expect for our future? Is this what we want? 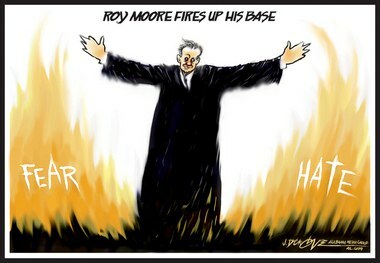 If Moore is a child abuser, then I agree that he and his lifes work is hypocritical. Im more concerned that the same Senators who supported his Republican opponent ( McConnell, McCain, etc) are distracting from their own issues, and fear a man who cant be compromised and therefore controlled to play ball. Falsely accusing Judge Moore out of spite after falsely accusing President Trump out of spite w/ fake dossier seem to tarnish his past heroism. And believability. He clearly has a motive to take out Moore to maintain his own power. Just a thought. May I offer some thoughts re: Evangelical Christian support of Mr. Moore? 1. We all bear the shame and the glory of the Cross. When anyone in our Christian family fails, separates, sins, etc. we are hurt because we belong to the same body. 2. Major characters of the Bible including the Lord were scorned, falsely accused, and even conspired against. All who are accused in public opinion of a crime are innocent until proven guilty. I will cheer when Judge Moore goes to court, and then we can see that he or his accusers are brought to justice. Thanks for post!